Join today to meet local mature gay men over 50 in the easiest and most hassle free way possible, from home, or on your mobile while out and about. Our professional gay dating website is safe, secure and completely confidential. What Is Online Mature Gay Dating? Before we were given the miracle of the Internet, we were stuck with either meat market telephone dating services or ant sized personal ads in local newspapers or a national magazine. Since the Internet arrived, we've been spoilt for choice of which website or dating app to use to find that special genuine somebody. But how many of those gay dating sites or apps are tailored for mature guys like you? Not that many, which is why we created 50Gay.co.uk just for you. 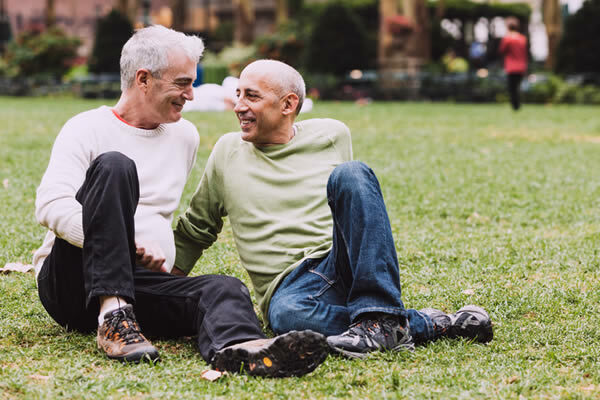 When you join a mature gay dating service such as ours, instead of sending a personal ad in the post or leaving a jittery voice profile over the phone, you can write a realistic profile about yourself, who you'd like to meet and what experiences you'd like to share with somebody you really click with. Don't forget to add a happy photo of yourself in a well lit room as well. You really will get 80% more attention with a photo profile. Once you're happy with your live profile, you can either sit back and wait for our members to contact you, or you can browse mature gay men local to you or from across the country. Once you've found somebody exciting, drop them a line and break the ice. We have lots of single guys over 50 in our database, looking to meet other guys, just like you. Just select either your nearest city or your region from the menu's below for a preview of our latest members near you. With many members across the country, ours is one of The UK's longest running and most trusted gay dating websites for the over 50's, with award winning customer service. Our service and the tools we offer are as simple to use as possible, but should you find yourself a little stuck, support is just a click away, no matter what the problem might be. Don't be shy, get in touch.